The statue puzzles in the Resident Evil 2 Remake are a set of early-game puzzles that you’ll have to solve. These include the Lion, Unicorn, Maiden, and Goddess Statue. Solving three of them grants you a medallion each, allowing you to solve the last one. However, solving the three puzzles can be a bit of a problem, as can finding them and getting to them in the first place. To help you out, here’s our Resident Evil 2 Remake Lion, Unicorn, Maiden, Goddess Puzzle Solutions guide to show you how to solve all statue puzzles in the police station, including the Goddess Puzzle, thereby open your way forward; as well as where to find the statues. The Lion Statue is available to you pretty much from the start. It’s on the opposite side of the Main Hall from the Goddess Statue. The solution to the puzzle is: Lion Head, Branch with Leaves, Eagle. If you’re playing through the B-scenario, the solution is: The Crown, The Fire on a Pedestal, and The Bird with Olive Branch. Once you enter the appropriate code, you’ll get the Lion Medallion, which is the first step to completing the Goddess Statue puzzle. Resident Evil 2 Remake – How to Complete Unicorn Statue Puzzle? To complete the Unicorn Statue puzzle and get the Unicorn Medallion in the RE2 remake, you need to input the following code: Pisces (pair of fish), Scorpio (scorpion), and Aquarius (jug of water). In case you’re on the B scenario, the new solution will be as follows: Gemini (the twins), Libra (the scales), and what looks like a worm or snake vaguely in the shape of the number 3. Incidentally, the Unicorn Statue is in the Lounge area. You can access it from the West Storage Room, left of the Main Hall on the map. You’ll need the blue key from the third floor to unlock it. 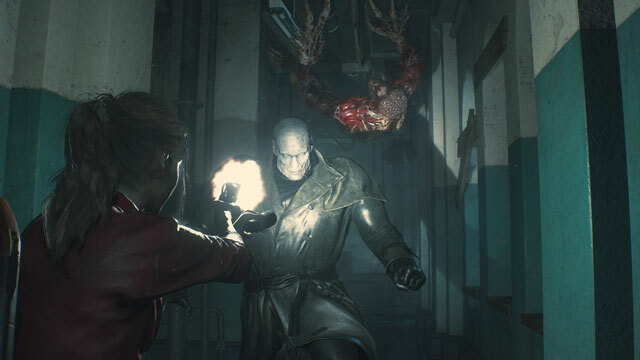 The solution to the Maiden Statue in the remake of Resident Evil 2 remake is a little harder to get. This is because most of the symbols are scratched off, so it’s more difficult. Here are the symbols you need: Virgo (the head of a woman, of which you can only see the bottom part), Sagittarius (bow and arrow), and Snake (the symbol just beneath the branch symbol from the Lion Statue). In the B-scenario, you have to input the following sequence: Aries (the head of a ram), the harp, and the bird (the sparrow-looking one). Then, just collect the Medallion. The Maiden Statue is in the West Storage Room, behind a blockade. Removing the blockade requires you to retrieve a Battery from the S.T.A.R.S. office, and the Electronic Gadget from the Operations Room. Combine them to get the Detonator, then place it on the blocks of C4 to blow the wall up and open the way to the Maiden Statue. How to Solve Goddess Statue Puzzle in Main Hall in RE2 Remake? To solve the Goddess Statue puzzle in the Main Hall of the station, all you have to do is place the three medallions in the slots at the statue’s base. It’s by far the easiest step of this journey. Simply approach the base, interact with it, and insert a medallion. Do this three times, and you’ll solve the puzzle. The game will automatically slot them into the correct place, so you don’t have to think about what you’re doing at all.